HS POP3 library is a software library in C (supplied with full source code) . 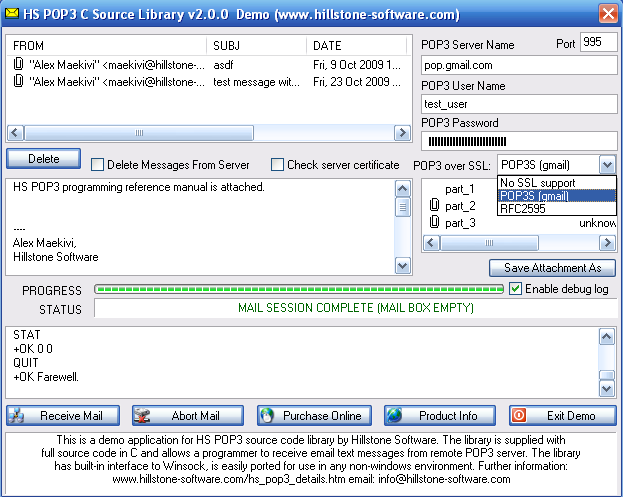 ...... HS POP3 supports extracting binary file attachments in MIME v1.0 base64 format..From version 2.0.0 HS SMTP supports secure SMTP over TLS / SSL (RFC 3207). HS POP3 library then resolves the server name, connects to it and receives message scan list according to RFC1939 standard. Once HS POP3 has a unique message ID from the server, it reports this message ID to user application via callback function. The user application returns a specific value if it wants to receive this message. Qweas is providing links to HS POP3 Library 2.0.0 as a courtesy, and makes no representations regarding HS POP3 Library or any other applications or any information related thereto. Any questions, complaints or claims regarding this application HS POP3 Library 2.0.0 must be directed to the appropriate software vendor. You may click the publisher link of HS POP3 Library on the top of this page to get more details about the vendor.